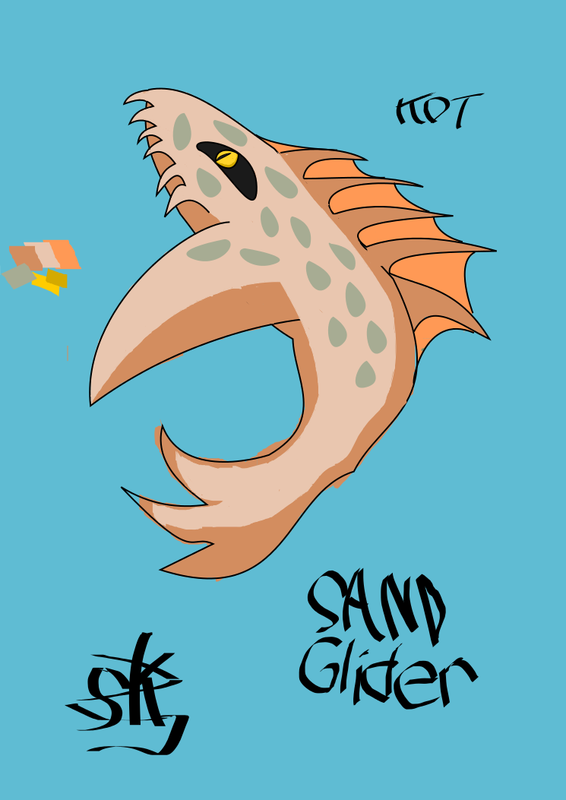 These creatures are tan fish-like creatures with a pair of wing-like fins, that lives in the sand of the desert. They have feathery gills, and have a eel-like tail. These may not be hostile, but if you attack them, they will fight back. They will not stray from the desert, because they die when removed from the desert for some reason. , if they are startled they jump out of the ground and start gliding away. Their scales are made of a conductor, and are use by Gerudo as quick transport around the desert. You can use all items on it to damage it when it's out of the ground, but only they do half damage. When it jumps out of the sand, if your next to it, there will be an action prompt to grab it, it will then glide in a random direction. If you use magnetic gloves you can attach to it and control the direction it's in and you can use it's divebomb attack to attack desert dwelling creatures. While it's gliding, if it gets close to a city, the edge of the desert, or is going to run into a rock formation, it will dive into the ground leaving link stuck at the surface, with his head stuck in the sand. After a certain amount of time it will flap it's "wings" rapidly and then dive into the ground leaving link stuck at the surface as well. While your on it you can jump off of it using the action button, which can help you get to higher places within the desert. 1 HP This attack is only used when it's enraged. It dives down and rams link then swoops back up. This page was last modified on 13 January 2013, at 19:53.